Posted on Sat, Dec 10, 2011 : 8:14 p.m.
Michigan sophomore Evan Smotrycz drives against former Wolverine Laval Lucas-Perry. Smotryz made 7-of-8 shots and scored a career-high 20 points in Michigan's 90-80 win over Oakland at The Palace of Auburn Hills on Saturday. Evan Smotrycz is starting to grow up. Over the summer, the 6-foot-9 sophomore forward on the Michigan basketball team took a large step in his development by adding 30 pounds of muscle to his already long frame. On Saturday, Smotrycz went one step further. "If I can stay on the floor," said Smotrycz, "I have a good chance to make things happen." Smotrycz avoided foul trouble, his one consistent bugaboo this season, and the result was the most productive game of his young career. Smotrycz racked up career-highs in points (20), rebounds (9) and minutes (33) during a 90-80 win over Oakland at the Palace of Auburn Hills. Smotrycz started out strong and never looked back. After knocking down a 3-pointer to cap an early 15-0 Michigan run, the sophomore had already met his season average of eight points and five rebounds -- and the game was just seven minutes old. "He's worked so hard with the consistency in his shot and (his ability) to just stay on the court," Michigan coach John Beilein said of Smotrycz, who had been averaging 3.6 fouls per game coming in. "He's learning every day. He'll still get a bit too anxious with what he's trying to do. "But that was his best game since he's been here." Smotrycz finished 7-for-8 from the floor, 4-for-5 from long range and added two steals in the process. But more than that, he played to his size -- grabbing nine rebounds. Entering the game, Oakland was averaging nearly 40 rebounds per game, and 13.7 on the offensive end. Thanks to Smotrycz's efforts (and a combined 19 rebounds from Zack Novak, Jordan Morgan and Jon Horford), Michigan took away Oakland's advantage near the basket, holding a 36-28 edge on the glass. "He was rebounding," Novak said. "That's the biggest thing we can get out of him. We know he can knock down shots, so he did a good job with that. But when he's rebounding and knocking down open shots, that's tough. "He's a 6-9 four-man that (can put the ball on the floor), shoot it, and when he can rebound on top of that? That's big time." Smotrycz said there really wasn't one key to his consistent performance, just making a conscious effort to keep himself in position and play within himself. "Mentally I've got to talk myself through possessions and make sure I don't have any dumb ones," he said. "Just stay in the system." Stu Douglass against Oakland on Saturday. Stu Douglass' first 20 minutes Saturday looked a lot like his first eight games of the season. He was 0-for-1 from the floor in just seven minutes. In short, he was non-existent. The second-half, though, was a different story as Douglass went 4-for-6 from the floor (2-for-4 from 3-point range) to score 11 of his 13 total points. "In the first half, we weren't playing Michigan basketball and I was definitely guilty of that," Douglass said after the win. "I had some lapses here or there defensively, so I knew I had to do some big things for the team to try and redeem myself." Douglass had his best performance since a 14-point showing in the season opener. Entering the game, Douglass was shooting just 38 percent from the floor, 28 percent from 3-point range. His struggles were obvious, but his support from Beilein never wavered. On Saturday, it finally all came together. "When you're only getting one or two shots a game, I don't see it as a slump," Beilein said. "He is a really good shooter and we need him on the floor. "He gave us a pretty good lift and he's had a couple of those (games) in his career here." After being asked why he has no interest in renewing a series against Oakland on Friday, Beilein was asked twice more following Saturday's win. The end result was more of the same. Little explanation, just a firm no. "We just played them (for) four years," Beilein said. "Is there another in-state school, besides Michigan State, that we (haven't) played in the past four years? Eastern Michigan, Central Michigan, Western Michigan, Detroit? ... We have all kinds of options in the future. I'm not saying (what will happen), I'm just saying, we made a four-year commitment, we (honored) it and it was great." 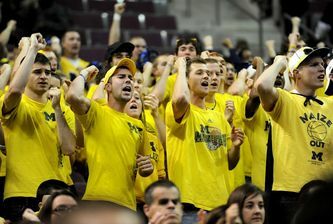 Scoreboard malfunctions meant fans at The Palace on Saturday, like these Maize Rage members, had to be told the score by the public address announcer. Michigan's first appearance at The Palace since the 2008-09 season was a bit of an odd one. The game started five minutes late due to clock malfunctions, and was stopped periodically after continued failures to the shot and game clocks above the baskets. The arena's overhead scoreboard rarely showed the running score, and the public address announcer spent most of the game telling the score to the crowd of 17,118. "That was very difficult," Beilein said of not knowing the score. "(Michigan director of basketball operations Travis Conlan) was keeping the score and for some reason I wasn't hearing the guy on the PA very well. "It was difficult for the kids, too. We were in one timeout and Zack didn't know how much we were up (by). It was distracting, but it's something you have to deal with. It could happen again somewhere else." Michigan set a season-high with 21 assists, but also had a season-worst 17 turnovers. Freshman point guard Trey Burke matched a career-high with nine assists, while Novak set a career-high with eight assists. ... Oakland's Reggie Hamilton went a perfect 12-for-12 from the foul line, and is now shooting 92.4 percent (72-for-79) on the season. ... Saturday's announced attendance of 17,118 was three bodies higher than Oakland's game at The Palace last season against Michigan State, a one-point Spartan win that drew 17,115. Sun, Dec 11, 2011 : 5:41 p.m.
Daveya24, the game was at the Palace of Auburn Hills, not Crisler. The Palace gets the blame for the technology problem. Sun, Dec 11, 2011 : 11:01 p.m.
Sun, Dec 11, 2011 : 2:45 p.m.
Nick, I like the article and I'm a big Michigan Basketball fan, but how does someone gain 30 pounds of muscle in 1 Summer? That can't be right. 30 pounds of muscle in 1 year seems like a lot to me........ And what's up with the scoreboards at U of M these days? I wonder if that new basketball facility is drawing more amps from the entire sports complex than was anticipated? Anyway, good win for Michigan. Oakland is a solid team and you have to play well to beat them. Mon, Dec 12, 2011 : 5:05 p.m.
His weight gain of 30 pounds has been well documented many times. I don't know if it's all muscle or not though. Maybe his &quot;freshman 15&quot; weight gain was actually 30, being 6-9 and all. With all the cardio these guys do it would have been hard for him to gain any weight during the season last year.